Volkswagen has unveiled a new research car that could provide a heads up on the technology and design for the next-generation Golf. Volkswagen’s Gen.E research vehicle gives a hint of where the next Golf is going. Revealed at the brand’s Future Mobility Days 2017 at its Wolfsburg, Germany headquarters, the Gen.E research vehicle shows the carmaker’s plans for electric vehicle charging, which envisages charger-robot concepts for underground garages and car parks to connect the car to chargers. The carmaker said the vision could enable plans for next-generation EVs with a range of more than 400km (249 miles) that would bring a lightweight architecture designed for maximum crash-resistance and a battery based on further developed lithium-ion cells. No plans have been revealed for the research car but the three-door hatchback could well see its styling and technology echoed in the next Golf. 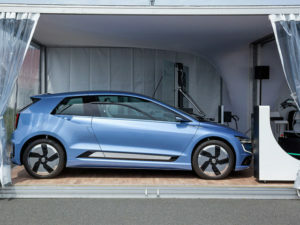 Other research work covered at the event included VW’s GasOn lean CNG combustion project, new approaches to plug-in hybrid drive technology and a self-learning chassis as part of the use of artificial intelligence in autonomous technology.